We have relatives and ancestors who have to eat so much raw food in a day that they can't sleep nights. In an entrancing introduction to the world our distant ancestors inhabited, researchers in Brazil have discovered that fire and/or cooking had to be developed for our diet long before palaeontologists believed possible, around 1.7 million years ago. "If you eat only raw food, there are not enough hours in the day to get enough calories to build such a large brain," quotes Suzana Herculano-Houzel, the neuroscientist who is co-author of the report. "We can afford more neurons, thanks to cooking." A battle looks likely over the dates, at least. Palaeoanthropologist, Robert Martin of The Field Museum in Chicago, Illinois, says the research "provides the first evidence that metabolic limitations from a raw food diet impose a limit on how big a primate's brain--or body--can grow". He says that he thinks "the jury is still out" on whether cooking caused brain size increase in H. erectus Archaeology finds actual hearths only 800,000 years ago and brain size also increased 600,000 years ago, so he has a point! Above: The number of brain neurons and body mass among primate species on a diet of raw foods. Each curve represents the combination of values for which the energy requirements for body and brain is equal to the energy intake (given a certain number of daily hours of feeding as indicated.) The shaded area beneath each curve indicates the viable combinations of body mass and number of brain neurons for a primate species that fed for that number of hours per day (the hours are shown as 5h, 6h, 8h or 10h). 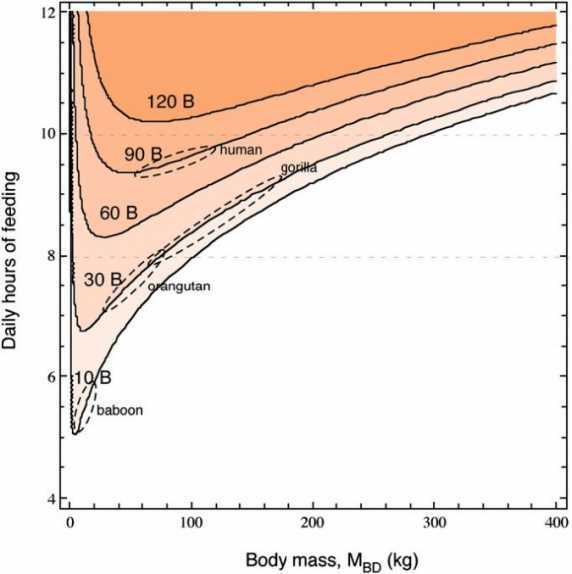 Humans are not shown on this graph, but appear on the next graph. 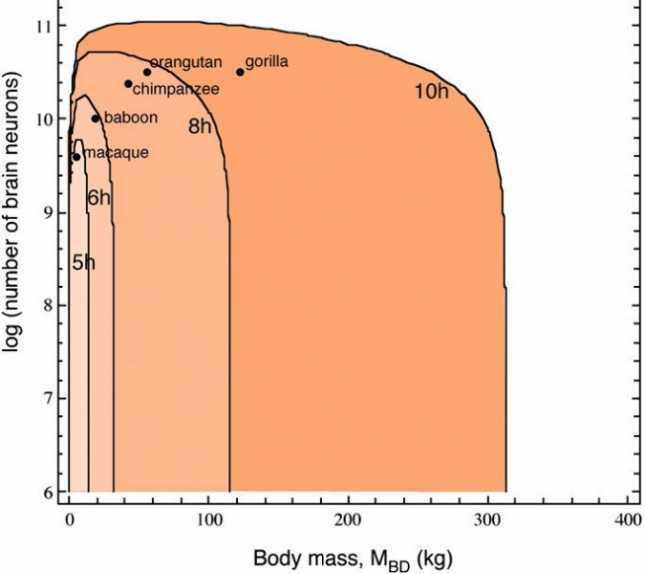 The graph here shows that brain size increases with weight, but that size doesn't always mean a bigger brain, as shown by the gorilla. While we seem to have an enormous brain compared to our size, the other primates (apart from the gorilla) get along nicely with a brain comparable with their tiny mass (an 8g brain) or the chimpanzee mass (large - brain). The upside-down U-shape indicates that the number of hours feeding is not just related to weight. It also influences how large the brain can be (in neurons). It's amazing that our relatively small brain uses up 20% of our energy (less in other primates). This means that you have to trade your hours of feeding for either large body size or larger brain. What a choice! Gorillas seem from this study to be at a disadvantage, possibly because of their gigantism. They theoretically have to feed for 8.8 hours, but in fact only do so normally for 7.8. The answer to that problem seems to lie in observed gorillas having to feed for 10 hours a day in extreme conditions - who knows why there is a disparity? Certainly this species seems to be at the limit of body size and brain size (Note how the brain is smaller than would be expected in a primate of that size). The next graph cleverly shows that relationship between mass and brain size or number of neurons. If you want the 90 billion neurons of a human, a gorilla would have to forage for more than10 hours every day or lose a heck of a lot of mass. Every increase in the number of brain cells seem to steeply increase daily feeding hours. The energy requirement for primates to "afford" a brain with 2% of their mass (average percentage or the 0.4 to 4% range) would give an 8 hours/day gorilla a 42.4kg body and 49 billion neurons. At only 6 hours/day, the gorilla would be literally reduced to 14.3kg and 17 billion neurons feeding. All this of course leads to the human evolution debate. Fossil skulls give us the data to reveal that early "hominins" had 30-40 billion neurons, which, at 7 hours/day, would produce their estimated body mass. Homo erectus as the first "big-brain," would need more than 8hours/day to feed his 62 billion neurons. Assuming these species ate raw food, the later species such as H. neanderthalensis and ourselves would need more than 9 hours/day. The great apes today don't spend anywhere near that length of time feeding, so we have to assume something is missing from the equation. That something is, "We can afford more neurons, thanks to cooking." Above: Hours of feeding required per day to sustain a certain number of neurons and body mass. The horizontal lines illustrate that increasing mass comes at a cost of a reduced number of brain neurons if the number of daily hours of feeding is maintained. The line at 8 h/d indicates the average maximal number of daily hours of feeding practised by great apes, and the line at 10 h/d indicates the supposed maximal number of hours per day that could be spent feeding. When we face that supportable fact, it means we have to start looking at human evolution afresh. Were our ancestors more advanced than we thought? Almost certainly - even if they didn't use "hearths." It would take 9.3 hours per day for us to subsist on simple raw food whereas less than 8 hours is the norm for all but the gorilla. Now go figure how an "ape" with no hearth, but with fire could have evolved into a brain-box without getting his or her fingers burnt! Use the brain?